Today I am sharing one of my favorite ModCloth dresses! They had sold out of it so I patiently waited until it was back in stock. I got the restock email and lunged at the opportunity to add it to my closet. I like to keep it simple when I wear this dress. It has an adorable collar and I like to keep it the center of the attention. I already told you briefly about my experience at Texas Style Council last month but there was a specific moment that I want to share more about with you. Before I can tell you about this exciting moment on my last day at the event I have to first tell you what lead up to it. You may already know about my love for ModCloth. If you don’t then you can read more about it here, here, and most of my wish list or outfit posts I’ve done. 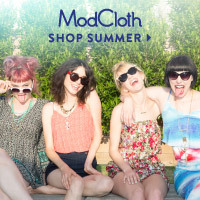 So, reading my blog it is pretty obvious that I have a deep seeded love for ModCloth. It isn’t just the adorable things they sell; it is about their values. They recently signed an anti-photoshoppping pledge because they want to help fight bodyshaming. They want their customers to see real women in their ads and on their site. I think that is pretty awesome. Plus they just picked their latest #Fashiontruth Monthly Spotlight winner and it is the super stylish Rye! Rye is transgender and shares a ton of her styles on ModCloth’s Style Gallery. I’ve always enjoyed Rye’s style and I’m glad she is getting some recognition. Plus, I love that they are getting Rye’s story out there. There is a lot of stigmas out there about being transgender and I think educating people is the first step towards making change happen. Way to go Rye for being awesome and thank you to ModCloth for introducing her to so many!! So, I have a lot of love for ModCloth. When I was thinking about attending Texas Style Council I entered a contest for a free ticket to attend. I figured if the stars aligned I would win the ticket and figure out how I would get there later. Unfortunately I didn’t win and decided that the expense was going to be too great. Between the cost of the convention, the plane ticket, and everything else it just wasn’t in my budget. I stared at their website for days just wishing I could attend. I knew it would be terrifying (traveling all the way to Austin alone to be surrounded by people I don’t know) but completely rewarding. I was bummed but I accepted that I wouldn’t get to go. I was so excited that I decided to forward the email to my parents. They have been my champions throughout my blogging journey and I wanted to share the sweet words with them. Almost immediately I got a phone call from my mother saying, “You have to go. How do we make it happen?” With the help of my amazing parents I was able to buy my ticket, use airline miles for my flight, and they used their Hilton Honors points for a hotel for the one night I needed one. It truly meant the world to me. Again, wow. I felt so special. I wanted to scream, or cry, because I was so happy. So I went over there. I introduced myself to their awesome representative, Jasmine, and expressed my interest in ModCloth. She told me about the affiliate program, handed me her card, and encouraged me to enter their contest. You had to “name the dress” that they had displayed. If you won you received the dress and a super cute yellow bag. I was having a brain fart. I stood there for a few minutes just staring at the dress trying to come up with a witty name. I landed on “What Does the Fox Wear” and threw my entry in their box. I forgot about it the rest of the weekend. That is until Sunday. Sunday we had our last event. They recognized a few people and announced the winners for the contests going on throughout the weekend. As Jasmine went up to the stage to stand with Indiana I got a knot in my stomach. See, they were running another contest where you enter a photo and you could win $150 to the store. I was crossing my fingers that I would win. First they announced the winner for naming the dress contest. Again, I forgot I even entered. That is until they started reading my entry. I sunk in my seat because I was so astonished. ME! I won!! Everyone at my table erupted in cheers. They knew my love for the shop and were super excited for me! Indiana brought me up on stage and told everyone about our emails leading up to Texas Style Council. How she told me ModCloth was going to be there and how I HAD to come. I was blown away! The dress I named is now up on the store and makes me feel so proud. I feel like I’ve contributed to the site in some way. This whole experience has been a pretty big highlight. I am not really sure how anything could top it! Thank you to Indiana for helping me get to Texas Style Council. Your words of encouragement were just what I needed to make the decision to go. Also, thank you to my parents for helping make it happen. I couldn’t have done it without you. Lastly, to Jasmine and ModCloth, thank you. Thank you for being a company I rely on to have outstanding morals. Thank you for loving your customers and always striving to have amazing customer service. You made me even more dedicated to your brand.